Custom-made flags are meant to last. That’s why we use a combination of the highest quality components and state-of-the-art manufacturing to give you the best looking and most durable customized flags in the Industry. We offer a wide variety of American-made flags including boat flags, flagpole flags, fundraiser flags, garden flags, golf flags, and miniature flags. Using state-of-the-art manufacturing, we produce the highest quality flags in the industry, including digital, silkscreen, and appliqué printing. Our team of flag makers will partner with you to understand your custom flag needs from when you first place an order throughout the entire manufacturing process. Since we’re a family-owned and operated company, you’ll receive quick, responsive customer service, a top-notch product, and peace of mind that your flag was made in the USA. What’s more American than that? There’s no better way for an organization or team to announce its presence than by proudly displaying a flag with its logo, name or message. 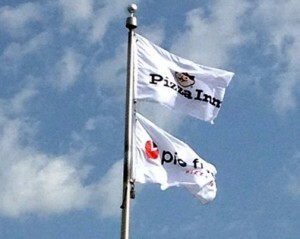 We’ve helped countless customers make such impressions with custom flags. A Stars & Stripes Flag Corporation is the custom flag maker that delivers the highest-quality products, whether you’re looking for a custom flag design for your school’s sports team, banners for your business at a trade show, flags for a special golf event, or any other type of custom-made flags you might need. We’ve been serving customers for more than 40 years, and our expertise makes us the best choice for any custom flag order. Not only can we deliver a superior product, but our fast response, ability to work with you on art, affordable prices and quick turnaround time make us the best choice for your project. Because all of our products are made in the USA, you also can feel good about working with A Stars & Stripes Flag Corporation. Regardless of the size of your order, we make the process of creating personalized flags as easy as possible. Our experience and comprehensive capabilities mean we can handle virtually any request, whether you provide us with the original art or need help developing the final design. In most cases, we can have finished flags shipped to you within 10 days of receiving the final design. For all of these reasons and more, A Stars & Stripes Flag Corporation should be your first choice for your custom flag project. Contact us today to get started – 1-800-757-0600. Ordering your custom flags is as easy as 1-2-3. Need some ideas of custom flag uses? We’ve got them! Let everyone on the water or in the marina know the name of your boat and/or send your custom message to those in view. Our flagpole flags are a unique way to draw attention and show your brand at your corporate offices, school, municipality or new home development. Custom fundraising flags are a great way to raise money while giving your followers a way to show their support and highlight your brand. Custom garden flags are a great way to decorate your landscaping with your personalized image or message. Design your own flag to promote your upcoming golf outing or event. With custom golf flags on each pin, it’ll set you apart! Custom miniature flags are great for giveaways or decorating tables at your next corporate event. Or print your school logo and give them away at alumni events! School spirit is very important. Custom sports flags are a great way to generate school or team spirit. Create one for your team or school today! Show pride in your battalion with a custom American-made military flag for those who fight for our country’s freedom. Need to create your own flag ASAP? Contact us today to get started with your flag project!